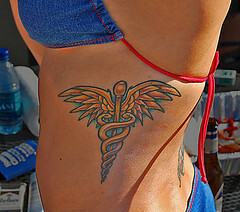 People have taken to tattooing medical directives on their bodies in case of an emergency. People undergo tattoos for many reasons, often sentimental ones, but more often than you'd think for medical causes. Patients have received tattoos to cover mastectomy scars, for example, or enhance the appearance of amputations. Another "tattoo" is actually a skin patch that can monitor vital signs. And scientists have gotten tattoos to celebrate their research, reports internist Toni Brayer, MD, FACP. Now, people are undergoing tattooing to direct emergency responders in case of an emergency. One pathologist inked "no CPR" on his chest, while others note their status as diabetics or as allergic to peanuts or penicillin, reports the Associated Press. The AP article outlines how people report that the more common alert bracelets can break or become lost. But, it notes, there's no standardization on how to present tattoos so emergency responders know to look for them, and there's certainly no legal precedent for how a clinician would follow such instructions in the absence of legal documentation. Endocrinologist Saleh Aldasouqi, MD, FACP, offers case reports from his own files and said that standards are needed for the practice, and that diabetics need to consult with their physicians before undergoing the needle. Along with tattooing comes body piercing. A review article considers all the issues that surround pierced body parts that primary care physicians should be aware of. Body piercing is on the cusp of entering mainstream acceptance, and a host of issues follow. One in five piercings become infected, typically with Staphylococcus aureus, group A streptococci and Pseudomonas, but rarely, there's coagulase-negative staphylococci, anaerobic bacteria, or atypical mycobacteria, reports the February issue of the American Journal of Clinical Dermatology. There have even been fatalities associated with them in the absence of any other source of infection.